Schadenfreude swept the country last month when a score of ultra-rich parents got sent to the principal’s office for participating in an elite college entrance-exam cheating scheme that juked SAT scores and fabricated athletic backgrounds for their kids. 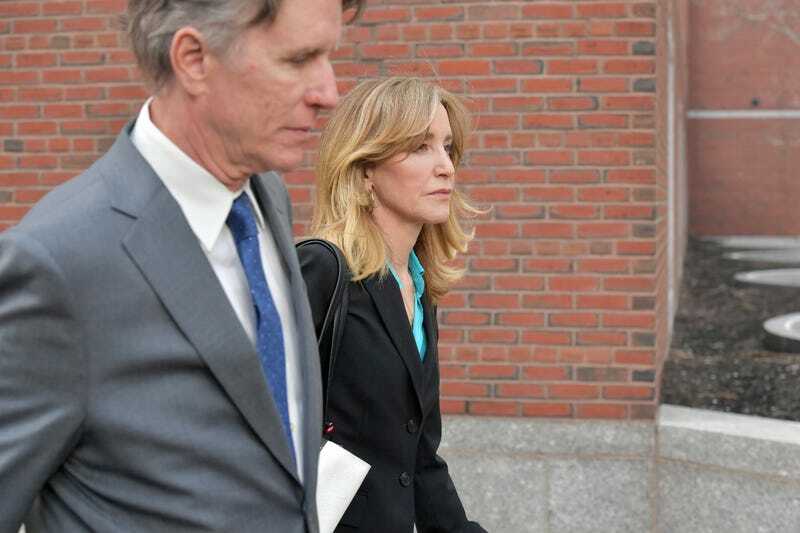 Today, The Hollywood Reporter reveals that 14 people, including Desperate Housewives actress Felicity Huffman, will plead guilty. Actress Lori Loughlin, another celebrity swept up in the scandal, has yet to issue a plea in the case. She and her husband, fashion designer Mossimo Giannulli, are facing felony charges of conspiracy to commit mail fraud and honest services mail fraud after they allegedly paid $500,000 to get their two daughters into the University of Southern California. Their influencer daughter, Olivia Jade, who seemed more annoyed by the prospect of going to school than anything, has since been dropped by brands like Sephora, TRESemmé, and Estée Lauder. Per a new report from People, she “would have never gone along with it if she thought this would happen.” It’s okay, though, because she’s very focused on trying to “rebuild her brand,” which, from what we can gather, involves posing next to free things people send her.